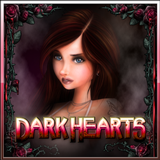 Two eerily-handsome vampires fight for the affection of a beautiful and mysterious young woman in the romantic new Dark Hearts slot, now at Slots Capital Casino. Until this Sunday, they'll give you 20 free spins on the new game! Prior deposit in October required; wagering requirement 60X. Available October 25-30, 2017 only. Dark Hearts has a great bonus game where you choose the type of bonus you like -- go for more free spins, or opt for a higher prize multiplier. Your choice. Three scatters trigger the bonus round. Once you're inside the Players Choice Chamber, you pick one of the two vampires, Viktor or Marcus, or Willow, the young woman they pursue. They each offer different free spins and multiplier combinations. If you choose vampire Viktor you get 30 free spins with 1X multiplier. Choosing Willow wins 15 free spins with 2X multiplier. If you pick Marcus, the other vampire, you receive 10 free spins with 3X multiplier. 20 free spins on new Halloween slot game available until October 30, 2017. Dark Hearts, from Rival Gaming, is an All Ways Pay game. A winning combination on any of the 243 lines pays out. You can bet up to ten coins per spin. Coins can be valued at $.01 to $.25 each for a minimum bet of just a penny and a max bet of $2.50 per spin. You can play the Dark Hearts vampire slot on your desktop or laptop computer in the download or instant play casinos. If you play more on your smartphone or tablet you'll enjoy the mobile casino version.